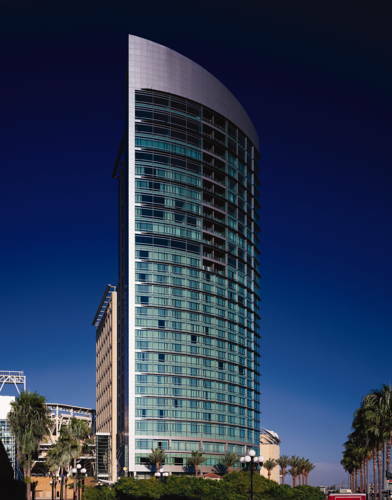 The Four Diamond Omni San Diego is located in the heart of downtown San Diego across from the convention center and adjacent to Petco Park, the home of the San Diego Padres. This modern glass high rise hotel reflects the natural beauty and modern sophistication of this vibrant city. All guest rooms and suites feature floor to ceiling windows and plush comforts such as Egyptian cotton sheets and fluffy terry robes. Rooms were designed with business and leisure travelers of today in mind and provide executive work desk with convenient power stations and electrical outlets. Guests can dine at the onsite McCormick and Schmicks Restaurant, enjoy a coffee or a local craft brew in Zumbido, and relax on the sun terrace beside the outdoor heated swimming pool and Jacuzzi. Guests can take in a baseball game at Petco Park next to the hotel or work out in the full service fitness center or enjoy many of the vast attractions of San Diego that are either within walking distance or a short drive away. San Diego International Airport is just 8 minutes from the hotel. Hotel is 100 percent smoke free. McCormick and Schmicks: McCormick and Schmicks serves over 40 varieties of fresh seafood on our menus each day. We offer steaks and poultry as well as salads and pasta. Aside from lunch or dinner there is an outstanding breakfast menu which features traditional fare and innovative specialty items. Daily Hours 0600 - 2200. McCormick and Schmicks Bar: The bar offers the perfect place for cocktails after work or a microbrew before a baseball game. Light snacks are also available. Daily Hours 1100 - 2300. Terrace Lounge: Poolside service located rooftop terrace which offers great food and poolside beverage service. The lounge is open seasonally from the end of June through the beginning of September. Daily Hours 1100 - 1900. Zumbido: Lobby Bar offering morning coffee, pastries, and counter service menu items. Afternoon features local craft brews on tap and California wines with a savory snack menu. Open daily from 6am-11pm. Also has a Happy Hour. The Omni San Diego is located across from the convention center, in the heart of downtown, and only steps from the many restaurants, nightclubs, boutiques and galleries of the Gaslamp Quarter. The hotel is connected via pedestrian sky-bridge to Petco Park. The San Diego trolley stops just 1 block from the hotel offering access to the many attractions of the area. Within a short drive guests can find more than 90 golf courses and miles of warm beaches. San Diego International airport is just an 8 minute drive away. San Diego International Airport / Lindbergh FieldNo free shuttle transportation to property. Commercial shuttle service is available from San Diego International Airport. Super shuttle service is available 24 hours a day and the cost is approx. 10.00 USD per person each way. Please call 800 974 8885 for reservations and additional information. City CenterNo free shuttle transportation to property. Within walking distance of hotel.